"This protein-packed breakfast looks beautiful and tastes indulgent! Cool and creamy yogurt, fresh berries, and graham cracker crumbs make this the perfect way to start your day!" Mix chocolate drink mix into plain Greek yogurt until fully combined. Spoon 2 1/2 tablespoons of chocolate Greek yogurt mixture into the bottom of each of two parfait glasses. 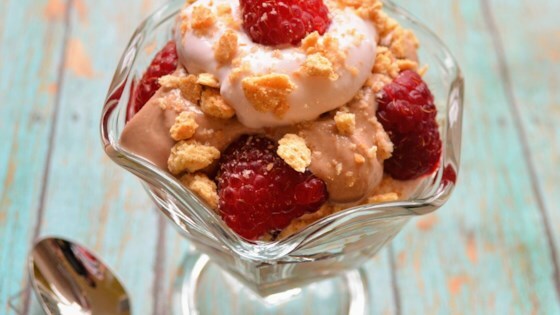 Top with 2 teaspoons of graham cracker crumbs, several raspberries, and by 2 1/2 tablespoons of raspberry yogurt. Repeat layers to build parfaits. This recipe lends itself easily to different yogurt or Carnation Breakfast Essentials® flavors, different types of berries, or even granola instead of graham cracker crumbs! Great combination of ingredients! I didn't have graham cracker crumbs so I crumbled up sugar cookies. Great way to use Carnation Instant Breakfast packets! Will make again. Creamy and delicious, perfect for a lovely afternoon snack. Super easy to make and a favorite flavor combo of mine. My son liked it too!